A group of MPs have called on the government to provide funding for a museum dedicated to women's suffrage. The cross-party group of 69 MPs led by Lucy Powell, the Labour and Co-op MP for Manchester Central, has written to the prime minister asking for funding for the Pankhurst Centre in Manchester. 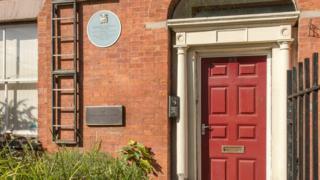 The centre is in the former home of suffragette leader Emmeline Pankhurst. Ms Powell said if the centre marked men's emancipation "it would be well-resourced and widely lauded". The letter has been signed by female and male MPs from various parties including Greens' co-leader Caroline Lucas, the SNP's Alison Thewliss, Jo Swinson of the Liberal Democrats, William Wragg of the Conservatives and independent MP Lady Hermon. The MPs said funding for the centre was "incredibly precarious". "Given its national importance and despite the amazing efforts of the volunteers who run it, its access and state of repair are not what they should be for such a national institution," the letter states. Gail Heath, chief executive of the Pankhurst Trust, said the centre can only open one day a week at the moment. "We just don't have the money, we don't have the funding to preserve the building," she said. "If it wasn't for our fabulous volunteers we wouldn't even open at all." The centre is applying for about £4m from the Heritage Lottery Fund, £450,000 will have to be raised by donations. It wants to use the funding to restore the building and develop its museum so it can be accessible for school groups. Emmeline Pankhurst founded the Women's Social and Political Union at the building at 60-62 Nelson Street in 1903.